People come to this beautiful yet beleaguered part of the world for all sorts of reasons. and disabled in the state’s military campaigns. and rehabilitation needs of the then 6,000 disabled IDF veterans. Almost all the aforementioned athletic visitors hailed from Canada under the aegis of the Toronto-based Canadian chapter of the ZDVO, Beit Halochem Canada: Aid to Disabled Veterans of Israel. Levy has been heavily involved in the event for many years, both in a managerial position and, more recently, also as a hands-on – actually feet-on – participant in the ride. degrees of difficulty. The various categories included a 37- to 55-km. daily route ride, with non-Israelis riding together with the IDF vets, and an off-road class going up to the Extreme classification which took in 93 to 131 km. per day, spiced with an impressive accumulation of climbs. soberly observed a couple of years ago. Eilat, and he was suitably enthused and appreciative of the experiential educational baggage he accrued over the fivedays of riding. “It was wonderful; it was a great experience,” he enthused. 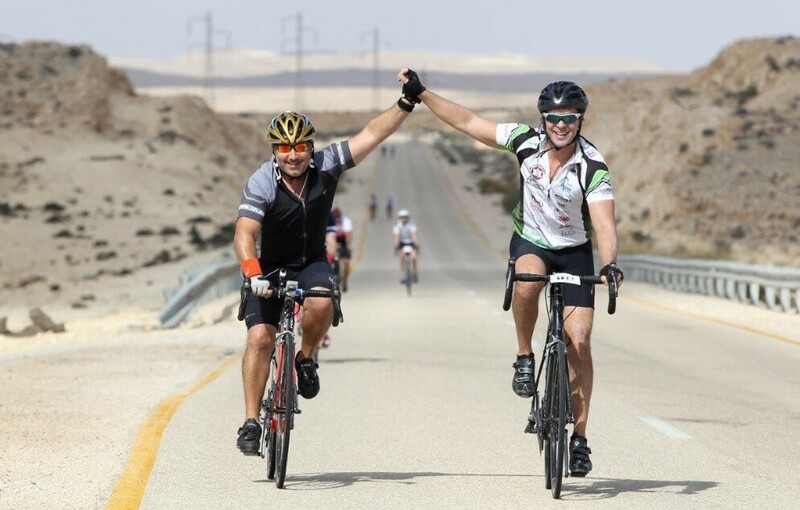 For Jacobs, joining IDF war veterans for five days of cycling around the country is also a way of connecting directly with the country, and seeing things through his own eyes, unimpacted by media hype. Yitzhak [Tzahki] Sarig has been on board the ZDVO event for several years now. The 64-year-old partner in a hi-tech company was badly wounded 43 years ago in the run-up to the Yom Kippur War. quarters of the IDF were aware that some form of military clash was imminent. Sarig’s unit’s duties included patrol activity. During one of the patrols, five days after the Syrian-IAF dogfight, the driver of the command car in which Sarig was traveling lost control of the vehicle. “The command car overturned and I was thrown out of it,” Sarig recalls. “Two of the soldiers in the car were killed outright. I was unconscious for three weeks.” By the time he came around, the Yom Kippur War had started and he was unable to take any part in it. Sadly, one of his brothers was killed in the war. Sarig learned of the tragedy only sometime after the incident. “He had the honor of taking part in the war. I didn’t,” Sarig declares. YOU DON’T need to be a psychology PhD to get the sense of guilt with which Sarig has lived for over four decades. That is compounded by the fact that he comes from an illustrious military family. His father was a commander in the Palmah fighting organization, and later in the IDF, and another sibling was a high-ranking army officer. Sarig was left with all sorts of physical injuries in addition to the emotional trauma, but eventually got on with his life. Besides establishing a highly successful hi-tech enterprise that develops software for educational institutions, he volunteered for reserve army duty, initial low medical profile and invalidity rating notwithstanding, and even took an officer’s course.Cycling came into his life quite a while later – seven years ago to be precise. “I got into cycling following an encounter with Ofer Eisenberg, who today runs the cycling activities at Beit Halochem in Tel Aviv, and he told me about cycling. I also heard about it from Anat Yahalom.” The latter also sustained serious wounds in the Yom Kippur and, like Sarig, operates a hand bike, and takes part in the annual ZDVO ride. to stop dealing with the past, stop thinking about the future. Now is what matters. You made some improvement today. Great. You just cycled half a kilometer. Yahalom’s life changer occurred 12 years ago. “They brought hand bikes to Israel for the firsttime. I suddenly realized that I could transport myself from place to place by bike – something I hadn’t been able to do for 30 years, because of my injuries. It was a delightful throwback for her.